Christmas is almost upon us and we have plenty of stocking fillers to get your shopping started. Planning a visit to Haworth? We’re on Main High Street (Map), and there’s lots for everyone to see in the run up to Christmas, from a Christmas market, scroggling the holly and a nativity to name a few! The Elves have been busy this year! Myself and my fellow ‘elves’ have been building up to this since August, busily creating hampers and preparing the shop for the festive period. Every inch of the stock room, filled with spare hampers, Christmas gifts and tempting treats. Can’t make it to Haworth? You’ll be missed! 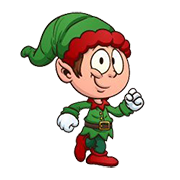 You can buy your sweets at our online store – “Click on our helpful Elf,” he’ll magically take you there! Postage and packing starts from as little as £3.99, and there’s free shipping on orders of £50.00 or more. What a year it has been, 2016 has (finally) seen the launch of our website, many more exciting brands on our shelves and more fantastic 1940’s, 1960’s and steampunk events to name just a few. We would like to thank you for your continued custom throughout the year and wish you all a very Merry Christmas and of course, a very happy and healthy 2017! You’ll soon be able to sign up to our newsletter (don’t worry, we won’t bombard you with email), but you will receive details about changes to our products and regular promotional offers. Please feel free to call in or get in touch, we are open Monday – Sunday 10am-5pm. Closed Tuesday.